Before I switched careers to become a chef, I used to work in the high-tech industry in Silicon Valley. And in 1998 my boss went on a trip to Paris and he brought me back a bottle of red wine and told me to keep it for six to eight years before drinking it. So I stuck the bottle in the back of a coat closet, behind the vacuum cleaner and forgot all about it...until I attended culinary school in the fall of 2003. During class one day we made French Onion Soup and I was so excited to come home and make it for dinner. It was one of those great fall evenings where the air was crisp and we were just about to get our first rain of the season. So here I am in the kitchen nursing my onions into a deep golden brown and I didn't have any red wine...or at least I thought I didn't. But then I remembered the bottle of forgotten red wine behind the vacuum cleaner and I excitedly removed the cork and added about a cup to my onions. All was well until my husband walked in the front door and noticed the "opened" bottle of French wine on the kitchen counter. He asked me why I opened it and before I could explain, he grabbed the bottle off the counter and went into the home office and looked it up on the Internet. To make a long story short, the bottle was worth $545, that's Five Hundred and Forty-Five Dollars and I used it for my French Onion Soup!!! Needless to say, we were both quite upset--obviously he more than me. But in my defense, I was only focused on culinary school and making the best French onion soup ever! But the evening had a happy ending--the soup turned out phenomenal and I let my husband drink what remained of the wine all to himself and it was one of the best meals we've ever had! If you don't have three hours to make French Onion Soup the proper way, then wait until you do. This recipe contains no flour, cornstarch, sugar, soy, tamari, or worcestershire sauce to obtain its deep/rich brown color. All it takes is ruby port wine, vegetable stock and a couple of hours to nurse and caramelize the onions and you've got an amazing authentic soup. Above is a photo of what the onions should look like before you add the majority of the vegetable stock. Once you get to this point, all you need to do is add the remaining stock and simmer the soup for about 20-30 minutes, ladle it into bowls and garnish it with cashew cheese sauce and croutons. 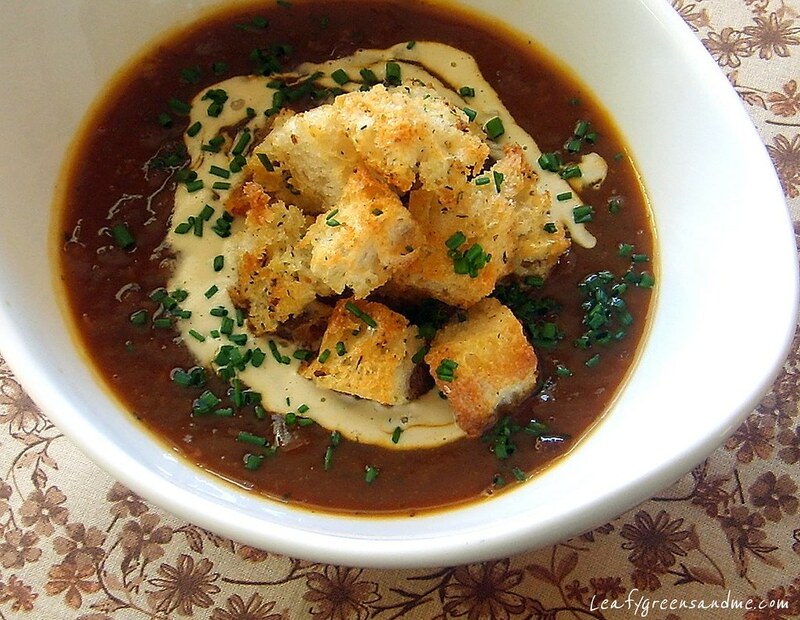 Even before I started eating a plant-based diet, I was never a big fan of garnishing French onion soup with a large toasted crostini and melted Gruyere cheese. I found it really hard to eat and I always felt like I was going to choke on all the cheese. So instead, I skip the cheese altogether and use a cashew cheese sauce and garnish the soup with herb-croutons. I find it so much easier to eat and you get a crunchy crouton in every bite! But if you're a big fan of melted vegan cheese, then by all means, add it to the soup and garnish it with the croutons. Heat a large dutch oven or stock pot on medium heat. Add olive oil and onions and cook on medium to medium-low for about 45 minutes until onions are soft, stirring frequently. Once the onions look like they're going to burn and stick to the bottom of the pan, deglaze with ruby port and cook for another 30-45 minutes, stirring frequently. Again, once the onions look like they're going to start burning ladle in 1 cup of vegetable stock and cook until reduced, about 15 minutes, stirring frequently. Ladle in another cup of vegetable stock and cook until reduced, stirring frequently. Add in garlic, thyme and dry sherry and cook for another 15 minutes, stirring frequently. At this point the onions should be a deep amber brown and look like the photo above. Add remaining vegetable stock, salt and pepper to taste and simmer for about 30 minutes. Toss bread cubes, herbs, olive oil, salt and pepper together and place on a sheet pan and bake in the oven for 15 minutes until lightly golden brown. To assemble, ladle the onion soup into deep bowls and garnish with cashew cheese sauce or vegan cheese, herb croutons and finely minced chives. I mentioned in a previous post that for the entire month of October I will be posting my Vegan Thanksgiving Series which will include: appetizers, soups, salads, main entrees, side dishes and desserts. Actually, my posts will probably extend into November as well because I will be out of town the week of October 10th and the week of October 24th. Anyway, my goal is to post about 25-30 recipes during this time. One of the recipes that I'm planning to share with you during my Thanksgiving Series is a Sweet Potato Gratin with Candied Maple Pecans. So the other night I decided to make a Potato, Spinach & Cheddar Cheese Gratin because I wanted to experiment with the recipe for the sauce. Actually, this sauce is really versatile and can be used for a number of different applications by just changing up a couple of the ingredients. I have used a version of this sauce for making lasagna, manicotti, moussaka, mac and cheese, quiche, tarts and for basic cream sauces. The gratin came out really wonderful. The flavors and textures were really great. You can also add roasted wild mushrooms to this recipe for a more complete entree, or serve this as a side dish with your favorite protein or roasted vegetables for a complete meal. This would also be a great dish to serve with your Thanksgiving dinner. It helps if you have a high-speed blender so you don't have to strain the cashew cream and the texture of the sauce holds up better under high heat. If not, no worries, just leave your blender running on high for about four minutes and then strain it before adding the other ingredients. Note: You may have cashew cream left over depending on the size of the casserole dish you use. Place it in a container and freeze for up to three months. To use, thaw in the fridge and blend before using. Cover cashews with filtered water and soak for up to 8 hours or overnight. Drain cashews and place in a blender with 1 1/4 cups filtered water. Blend on high until creamy for about 4 minutes. Strain mixture if you do not have a high speed blender like a Vita-Mix. Pre-heat oven to 350 degrees. Slice the top off the garlic head, drizzle with olive oil, salt and pepper, wrap in foil and bake until soft about 45-60 minutes. Let garlic cool and squeeze out soft garlic cloves and set aside. Heat a large saute pan on medium heat. Add olive oil, onions, minced garlic, and fresh thyme and cook until onions are soft, about 5-7 minutes. Add cashew cream, roasted garlic, onion mixture, cayenne pepper, Daiya Cheese, filtered water and salt and pepper to taste and blend until smooth and creamy. It should be thicker than heavy cream, more like the consistency of a loose custard. And if too thick add a little more water. Note: I used a 9x9" casserole dish for the gratin which made 6 servings. You may want to use a larger casserole dish. If so, increase the amount of potatoes and spinach that you purchase. 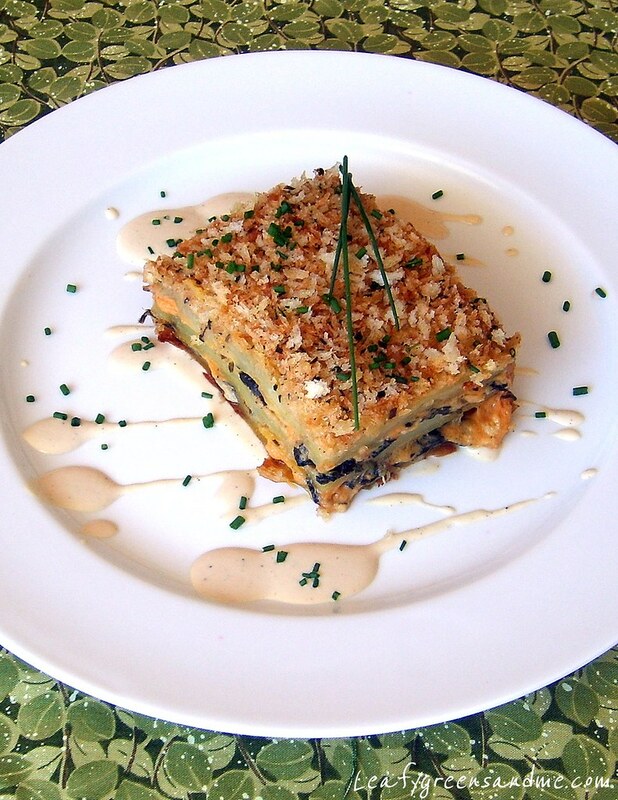 You will have plenty of the cashew cheddar cream and Daiya cheese for the gratin. Heat a large saute pan on medium-low, add olive oil, minced garlic and baby spinach, salt and pepper. Saute for about 2-3 minutes until spinach is wilted. Place in a strainer over a bowl and set aside. Before using, press out any remaining liquid with the back of a spoon. Wash, peel and slice potatoes thinly (1/16-1/32") on a mandolin, set aside. Place about 1/3 cup cashew cheese sauce on the bottom of the casserole dish or enough to cover the entire surface with a nice coating. Layer potatoes overlapping slightly to cover the entire surface. Repeat layering the potatoes two more times. Add another 1/3 cup of cashew cheese sauce over potatoes, making sure to cover the potatoes. Top with half of the drained, sauteed spinach and sprinkle with Daiya cheese and chives. Season with kosher salt and black pepper. For the second layer, repeat the same as the first with layering the potatoes (3 layers), then adding cheese sauce, spinach, Daiya cheese, chives, salt and pepper. For the final and top layer, just add potatoes (3 layers), cheese sauce and salt and pepper. Cover casserole dish with foil and bake in the oven for 1 hour to 30-45 minutes. Turn gratin after 30 minutes and check after 1 hour by inserting a toothpick in the center of the gratin. If there is any resistance, then cook longer, checking every 15 minutes until done. Remove gratin from oven, remove foil and top with another 1/3 cup of cheese cause and sprinkle liberally with herb-panko crust. Cover with foil and let gratin rest for about 10 minutes before cutting. Serve with additional warmed cashew cheese sauce. In a small saute pan, heat olive oil, add bread crumbs, herbs, salt and pepper and cook on low until panko is lightly golden brown. Stir frequently and be careful not to burn. When finished do not leave in hot pan, transfer to a bowl and then sprinkle on gratin. I really try to eat healthy on a regular basis but sometimes I get cravings for the not-so-healthy-stuff...everything in moderation right? While we were in Portland visiting family, we went to a restaurant and my husband ordered Tofu Buffalo Strips as an appetizer. They were really good, but I knew that I could improve on the recipe. So I decided to make my own version and they were really yummy...flavorful, spicy, crunchy on the outside, and soft as a pillow on the inside. Totally addicting--dipping them in the ranch dressing and popping them in your mouth. It will be a long time before I make these again, or at least until my cravings get the best of me! For my ranch dressing recipe, click on the link. To make the crunchy coating for the tofu, I set up a breading station: seasoned flour, seasoned Ener-g Egg Replacer and seasoned panko bread crumbs. I seasoned the flour and the bread crumbs with garlic powder, paprika, cayenne, salt and pepper. I seasoned the egg replacer with vegan "chicken" flavored seasoning, salt and pepper. For the red sauce, I purchased a bottle of Louisiana Hot Sauce, heated it and seasoned it with garlic powder and Earth Balance Buttery Sticks. For the tofu, I pressed firm tofu in a TofuXpress for 2 hours and patted it dry with a paper towel. I cut the tofu into 2x2" squares, dredged the pieces in flour, egg replacer and panko, and then deep-fried them at 350 degrees until golden brown. 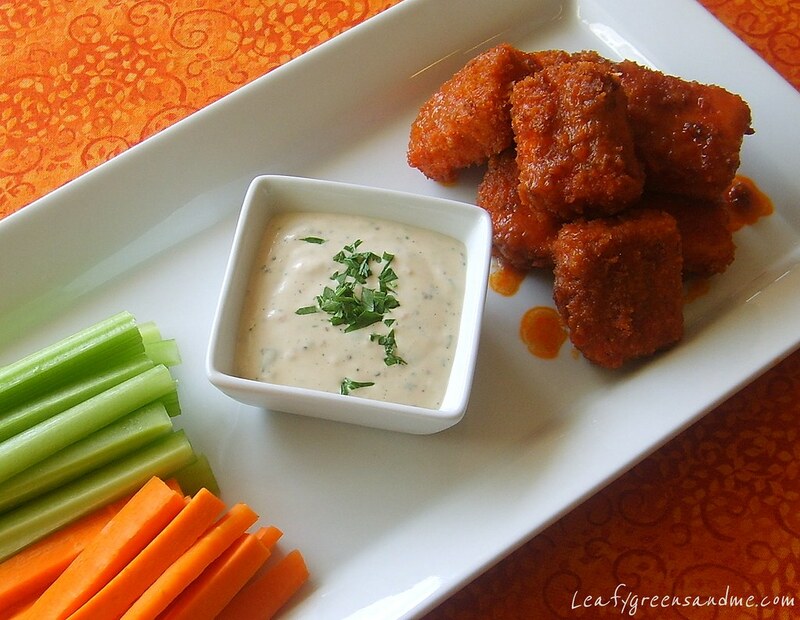 I then tossed them with the spicy red sauce and served them immediately, along with the ranch dressing, celery and carrot sticks. Mojo sauce first originated in the Canary Islands and migrated to the Caribbean Islands, Cuba and the Southern region of the United States. There are a lot of different flavored Mojo sauces--some are red, seasoned with paprika, others are green due to the large amounts of cilantro and parsley, but I prefer the Cuban version made with sour orange and lime juices. The high acidity of the sauce pairs really well with the earthiness of the portobello mushrooms. In addition to the freshly squeezed orange and lime juices, I added minced garlic, cumin, cilantro, olive oil and chipotle adobo sauce for a smokey flavor and a spicy kick. I garnished my fajitas with charred roasted tomato salsa, guacamole and cashew sour cream. 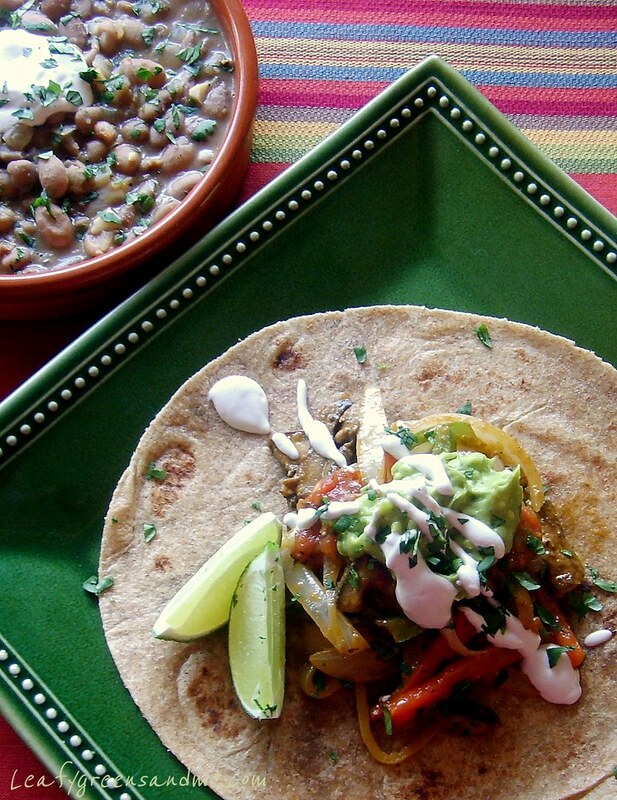 For a side dish I made re-fried pinto beans seasoned with minced onion, jalapeno, chili powder, cumin and cilantro. These portobello fajitas were probably the best fajitas I've ever eaten. The combination of flavors and textures were amazing! I never let my husband go grocery shopping with me because he takes forever. A 15 minute trip to the store can take up to an hour with him walking around the store and spending most of his time in the chip aisle. If he calls me on his way home from work and asks if I need anything, I always tell him no (even if I do) because I know that it will be quicker for me to run out and get it myself. So on Sunday we were coming back from Half Moon Bay and I needed to stop at Whole Foods to pick up some items and since he was with me, well...I couldn't make him wait in the car...:-). Anyway, we were in the bulk foods section and he was checking out all the items and asked why I've never made anything using Forbidden Black Rice. So I decided to purchase some and told him that I use it for dinner one night this week. I had no idea how nutritious black rice is...touted as the new "Superfood", with even more anthocyanin antioxidants (pigments found in the skin/peel of fruits and vegetables) than blueberries, and containing less sugar and more fiber. Also fruits and vegetables that contain high amounts of anthocyanin show promise in fighting heart disease, cancer and other diseases. Sounds really good to me! Plus, it has a delicious nutty flavor, great texture and looks beautiful on the plate. Since we've had really hot weather this week, I haven't felt like cooking much and so I just made a quick tofu stir fry, easy and delicious. I actually prefer the texture of black rice more than brown and so I plan to use it more often the future. And I have my husband to thank for that! In a small sauce pan add water, bring to a boil, add rice, stir, cover and reduce to a simmer. Cook for 35 minutes, remove from heat and let sit 10 minutes. Fluff with a fork, keep warm and set aside. Dice tofu into 1" cubes and marinate for at 30 minutes. Note: To keep the beautiful bright green color of broccoli and green beans, I never stir fry them. I blanch them separately and toss them in the dish just before serving to heat through. While the rice is cooking blanch green beans in boiling salted water for 2 minutes, place in an ice bath, remove and set aside. Blanch broccoli for a couple seconds, place in an ice bath, remove and set aside. Heat a large saute pan on medium heat, add canola oil, red pepper, tofu, marinade and baby bok choy leaves and cook until bok choy is wilted. Just before serving stir in broccoli and green beans and heat through. 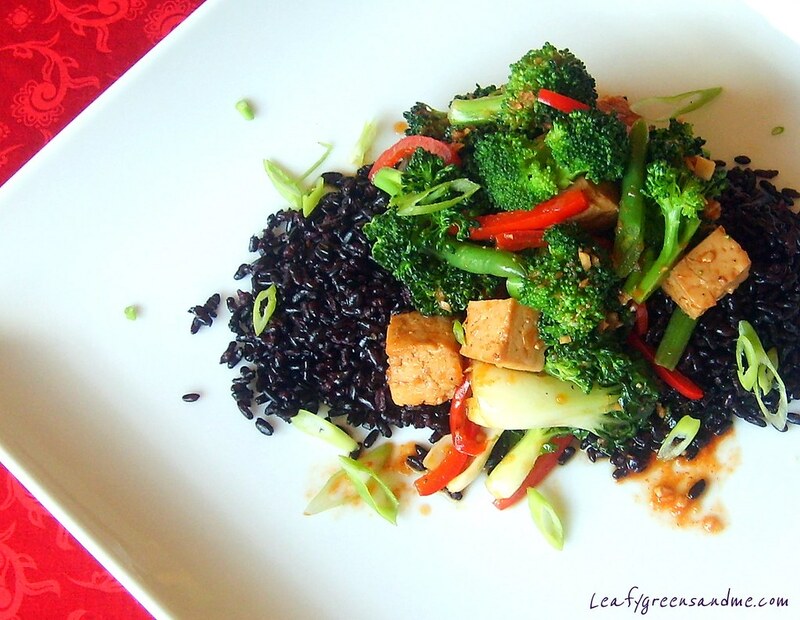 Serve over black rice, garnished with sunflower seeds, green onions and additional sauce. This is a beautiful and elegant dish to serve if you're having a dinner party. I used to serve this entree when I worked as a chef at a restaurant and our customers loved it. Of course, I used a different protein because I wasn't vegan back then, but this version tastes so much better. I used Gardein Chick'n Fillets because that is what I had in my freezer, but you can make a herb-panko crusted tempeh, seitan or tofu. 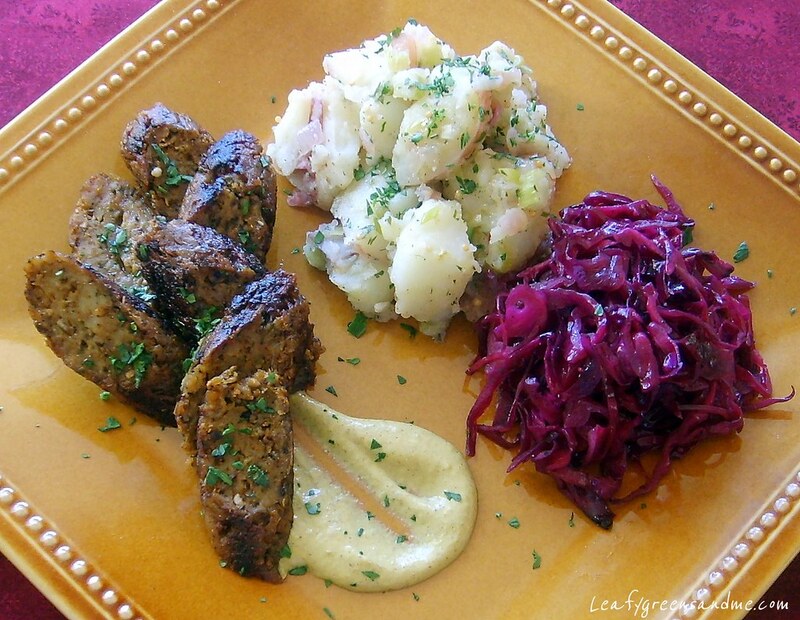 Beets, Tarragon and Mustard compliment each other really well--the flavors are just phenomenal together. If you have a juicer then making the couscous is really simple. If not, then you'll just have to do one extra step, but it's still really easy. Drain cashews and place in a blender with filtered water and blend on high for 3-4 minutes until creamy. 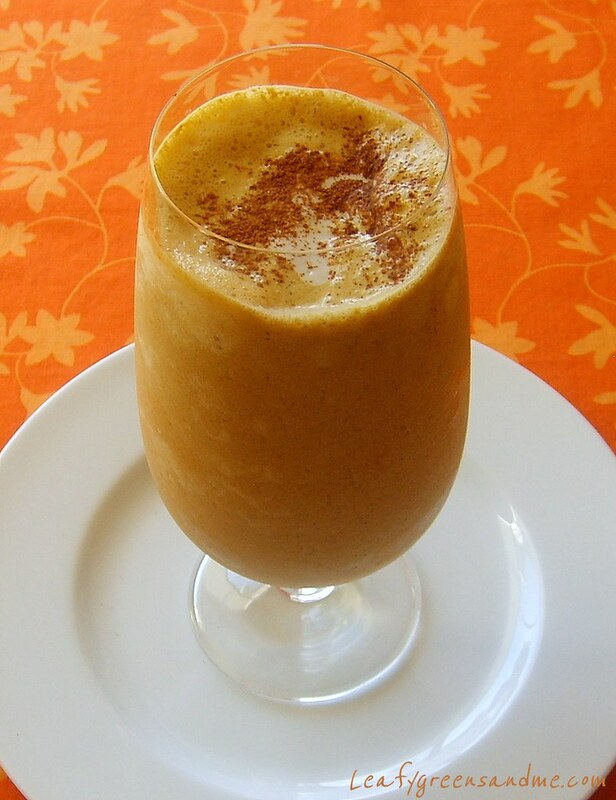 If using a high-speed blender you do not have to strain. If not, then strain cashew milk before using, set aside. You will have extra milk left over...add a little agave and use it with your breakfast cereal. Heat a small sauce pan on medium. Add olive oil, shallots and garlic and cook for about 3 minutes, stirring to prevent burning. Add white wine and pale sherry and cook until reduced by half. Add vegetable stock, Dijon mustard, agave and bring to a boil, reduce to a simmer and then add cashew cream and cook for about a minute longer until creamy. Stir in tarragon and season with salt and pepper to taste. Note: If you do not have a juicer then, wash, peel and dice beet. Place in a sauce pan with water to cover and cook until soft. Place beet and liquid in a blender or food processor and blend until smooth. Strain through a fine mesh strainer. You want to have at least a 1/4 cup beet juice when finished. Then proceed with the following directions to cook the couscous. Wash beet and place in the juicer. You want to have about a 1/4 cup beet juice when finished. In a small sauce pan, add filtered water, beet juice, couscous and salt and pepper. Bring to a boil and reduce to a simmer. Cook until couscous is soft and mostly all the liquid is absorbed, stirring frequently to prevent couscous from sticking. You may need to add additional water. Drain couscous really well, but do not rinse. Place back in the pot, stir in olive oil, cover and keep warm. Cook protein according to package directions, keep warm and set aside. In a saute pan, heat olive oil and saute spinach just until wilted. Season with salt and pepper and set aside. 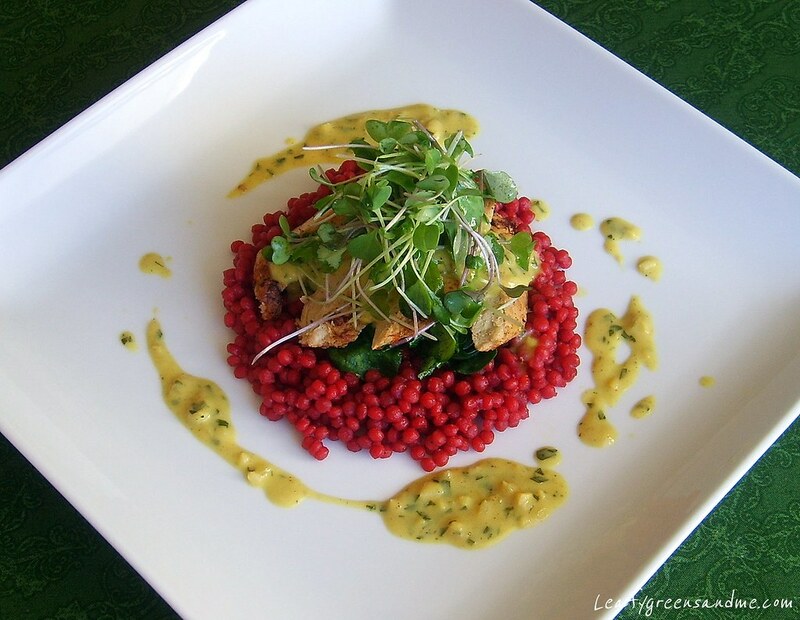 To plate, spoon ruby couscous on the plate, top with sauteed spinach, sliced protein on a bias, drizzle with tarragon mustard sauce and garnish with micro greens. And serve with a fruity Pinot Noir! I haven't had a Chai or Pumpkin Spice Frappuccino from Starbucks for over two years. I used to drink them on occasion before I switched to a vegan diet and never ever gave it a second thought as to how many grams of sugar they contained. Did you know that a tall 12oz Pumpkin Spice has 47g of sugar! My recipe is a little better coming in at about 25g for 16oz. However, mine contains real pumpkin puree. It is a little high in fat because of the cashew milk (about 7.5g fat) per 8oz, but as long as you share it with someone else, (which might be hard to do), it's a lot healthier for you than a soy frappuccino at Starbucks. Now, you don't need a Vita-Mix to make this recipe, any blender will do. But I finally broke down and purchased a Vita-Mix two weeks ago. I've wanted one for years, but couldn't justify the huge price tag. I still have a hard spending so much for a blender, but I use it everyday to make my own almond milk, green smoothies, sauces, and I made a strawberry-lime sorbet in 2 minutes. That's pretty amazing that a blender can do that! Anyway, I'm really happy with it so far and I know that I'll get a lot of use out of for many years to come. In a small sauce pan, heat almond milk to scalding, remove from heat, add tea bag and spices, cover and let steep for 15 minutes. Strain mixture into blender, pressing with a spoon so that most of the spices go into the blender. Add cashew milk, pumpkin puree, agave syrup, salt and ice and blend on high until smooth. Garnish with sifted cinnamon, and cashew cream (optional) see below. Note: You will have cashew milk left over. 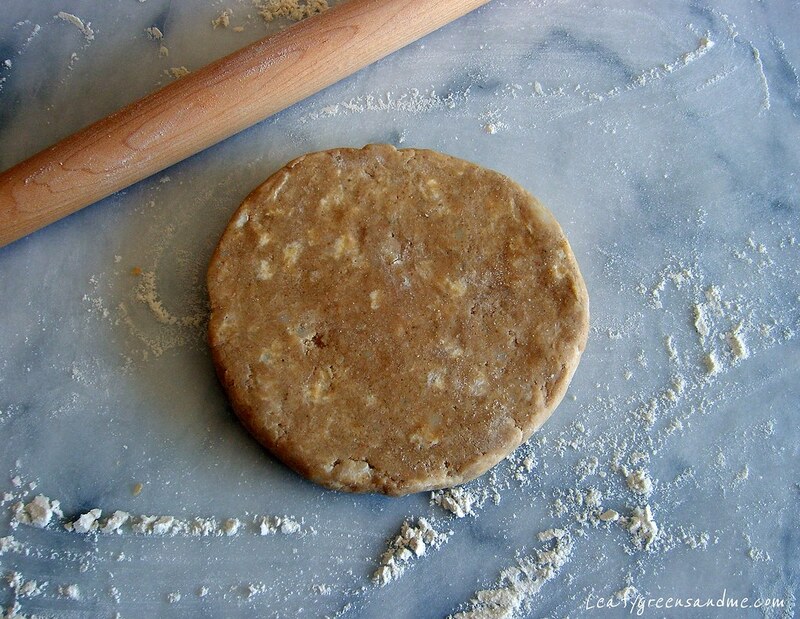 You can use it for breakfast in place of almond, soy or rice milk. I used less water in this recipe to give the frapp a creamier texture. If you want to use the cashew milk for other recipes, you can add water to thin it out a bit. Add all ingredients in a blender and blend until smooth. If using a high-speed blender you don't have to strain the milk. If using a regular blender, strain the mixture to remove solids. Add ingredients to a blender and blend until smooth and creamy. Chill in the refrigerator for 1 hour before using to thicken further. Tomorrow is the start of Oktoberfest in München Deutschland and it runs until the 3rd of Oktober. I've never been to München during the actual Oktoberfest, but I can only imagine how fun it would be having experienced the atmosphere of a Hofbräuhaus while vacationing in Germany. I grew up eating German food, well actually it was referred to as "Pennsylvania Dutch". My great grandparents, on my mother's side, immigrated to America from the Rheinland in the 1800's and settled in Pennsylvania. Funny...but as a young girl I always thought that my family was from The Netherlands "Dutch" instead of Germany "Deutsh". Anyway, growing up I remember my mom preparing potpie, spaetzle, sauerkraut, sauerbraten, funnel cakes and anything and everything pickled, and I've tried to carry on the tradition of serving a German meal on the first day of Oktoberfest throughout the years. I've never made seitan sausages before, but they turned out really delicious. I'm not a big fan of faux meat, but my husband is and so I made these for him. If you don't want to go through the trouble of making your own sausage, you can always purchase a brand or leave it out all together. 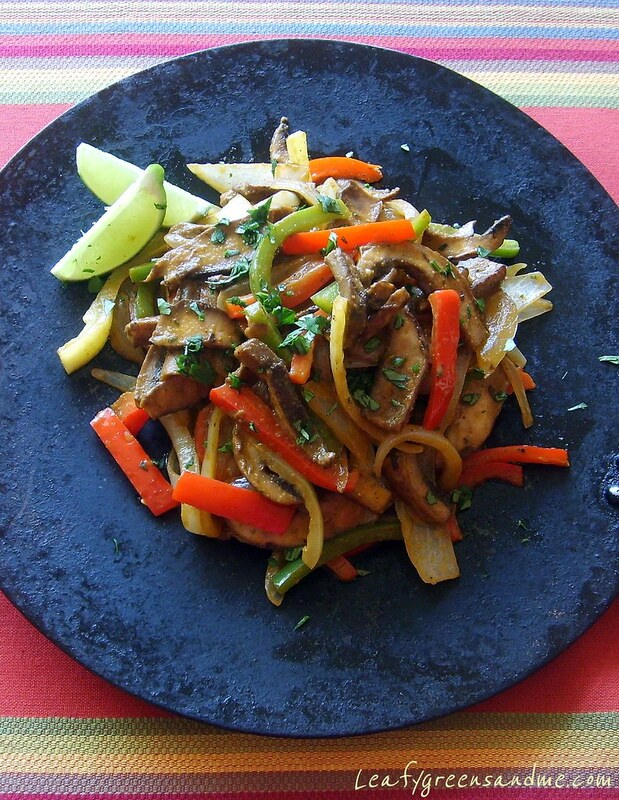 German food is very rich from all the proteins and starches they use in their cuisine. They balance this by adding acid from vinegar and a sweetness from the sugar. I prefer my food on the acidic side, but my husband prefers his on the milder side--so you may need to adjust the flavors based on your preference. Set up a steamer pot for the sausages. Add equal parts water/beer in the bottom of the steamer. Do not fill the liquid above the steamer tray. Tear six pieces of aluminum foil to wrap the sausages. You want them to be about 8"x8" or 10"x8" in size. Heat a saute pan on medium, add 1 tbsp olive oil and cook mushrooms until golden brown and all moisture is evaporated. Add diced onion and garlic and cook until onion is soft. Transfer mixture to a food processor and let cool. Heat vegetable stock to a simmer, remove from heat and pour a 1/2 cup of vegetable stock over textured soy protein to rehydrate. Let sit covered for 15 minutes. Drain remaining liquid and press TSP with the back of a spoon to remove any remaining moisture. Add TSP to the mushroom-onion mixture in the food processor and pulse 10 or 15 times until you have a fine grain. Do not over mix--you want it to have some texture. Whisk spices together in a small bowl and set aside. 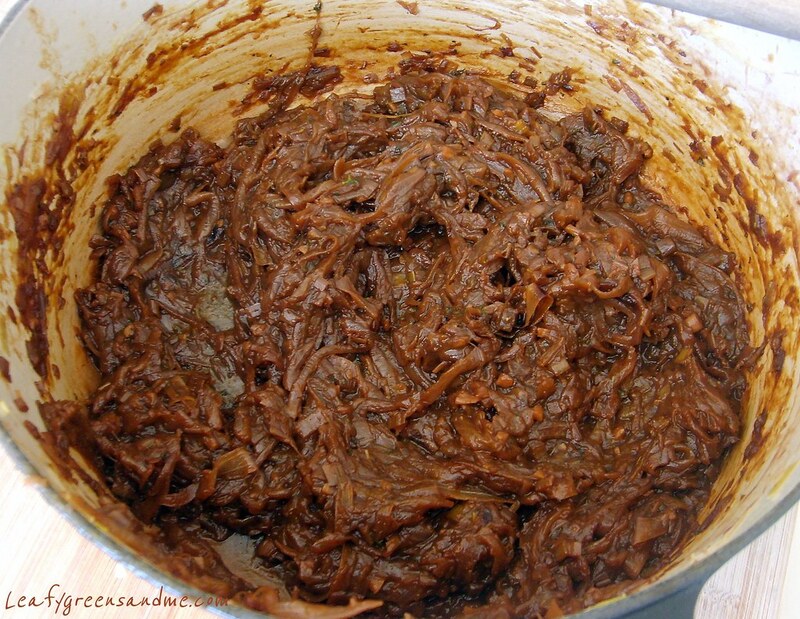 Transfer mushroom-onion-tsp mixture to a large bowl and stir in spice mixture until well combined. Next stir in vital wheat gluten until combined and then add 1 cup cooled vegetable stock and stir to combine. Divide mixture into 6 equal portions and working with one portion at a time, place the mixture onto the bottom edge of the foil and form into a 4-5" log. Roll up the foil like a tootsie roll and twist the edges tightly to close. Bring the steamer to a boil, reduce heat to medium-high and place sausages on steamer tray. Cover and steam for 35 minutes. Remove from heat and let sit for about 5 minutes and then remove. Let cool for about 10-15 minutes before unwrapping. To serve, heat 1-2 tbsp olive oil in a saute pan and cook sausages, turning frequently until golden brown. Remove and slice on a bias or serve in a bun. Boil potatoes until fork-tender, about 15 minutes. Be careful not to over cook--you don't want mashed potatoes. While potatoes are cooking heat a saute pan on medium and add 3 tbsp olive oil, mustard seeds and red onion. Cook until onion is soft, about 3-4 minutes and then add Dijon mustard, sugar and apple cider vinegar. Stir to combine and heat through. Turn heat to low to keep warm. Drain potatoes really well and place in a large bowl. Immediately pour over warm onion-vinegar mixture and stir to combine. Add celery, parsley, green onion and salt and pepper to taste. You may need to add more vinegar or olive oil depending on taste. Keep warm or serve at room temperature. Note: I'm not a big fan of caraway seeds and so I do not add them to my cabbage. If you like them then I'd start with adding a 1/2 tsp. Also, this cabbage is great with diced apples as well. Heat a large saute pan on medium, add olive oil, cabbage and cook for a couple of minutes until cabbage softens slightly. Add red wine and cook until wine is evaporated. Next add red wine vinegar, brown sugar and salt and pepper to taste and cook until cabbage is cooked and liquid is absorbed. You can tell that autumn is just around the corner...my favorite time of year. And I believe that this year we are definitely going to have an early fall based on the cooler temps we had all summer. It's fine by me because I love this time of year starting with Halloween and then ending with Thanksgiving, my two favorite holidays to cook and celebrate! I know that it may seem too early to start planning your Thanksgiving menu, but I always start two months before thinking about what I'm going to serve. So this year, I decided that I would take the entire month of October and post nothing but Thanksgiving dishes, including appetizers, entrees, side dishes, and of course desserts to help you plan your menu. With that said, I am now in the recipe development mode and obsessed with planning my entrees. First up is my Apple-Riesling Tart. It came out really good, but I still need to tweak it a bit. It's rather complicated because everything is made from scratch, the puree, the custard, the glaze, the crust, and not to mention a time-consuming design. 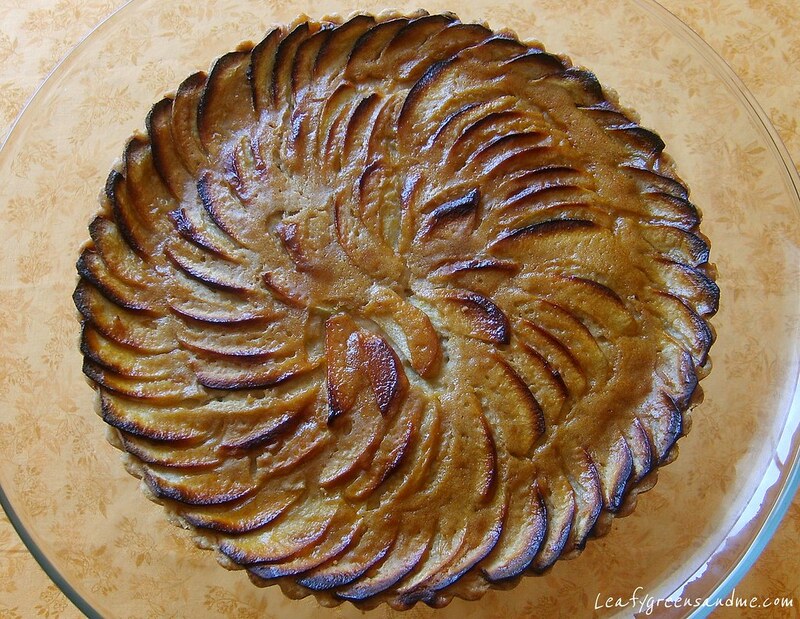 If you're like me though, you won't mind getting up at the crack of dawn on Thanksgiving morning to decorate your apple tart, but others may not want to take the time and effort. Fortunately, most of the components of the tart can be made in advance and assembled on the morning of. But I'd like to simplify the recipe a bit and I'd also like to test a gluten-free crust version. So check back on October 1st and follow along with me. It's never too early to start planning your menu and I hope that one of my recipes will be served at your Thanksgiving for many years to come! 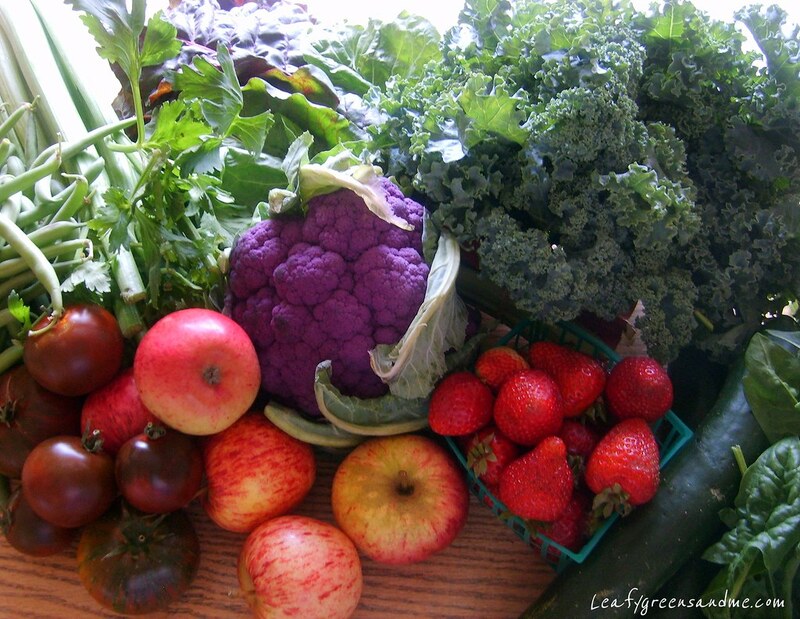 Do you ever go to the Farmers' Market or grocery store without having any idea about what you're going to purchase or make for dinner, but when you get there you want to buy everything? Well I went to the Farmers' Market on Saturday morning and just grabbed whatever looked good, which was really hard because everything looked good! Also my husband has been asking me to purchase purple cauliflower for quite a long time now and so this soup is for him. If you can't find purple cauliflower, white or orange will work just as well. Actually, a soup or entree made with a combination of all three colors would be really beautiful! Also, I used Rainbow Swiss Chard in this soup, but you can substitute green kale, or Cavolo Nero (Italian black kale) if you can find it at your market. Below is a photo of my Farmers' Market shopping spree. It's only Tuesday and I have just about used up all of my produce. I've made a strawberry-lime sorbet, heirloom-tomato sandwiches and numerous green smoothies. Lucky for me we live in the Bay Area and there is a farmers' market just about everyday of the week, all within a short driving distance from my home. In a large bowl whisk together herbs, vinegar and olive oil, and add diced bread cubes. Toss to coat and season with salt and pepper. Place on a sheet tray and bake for about 20-30 minutes until golden brown and crunchy. Toss croutons frequently for even cooking and to prevent burning. Turn up oven temperature to 400 degrees. Toss cauliflower with 1 tbsp olive oil, salt and pepper and roast for about 15 minutes until crisp-tender and lightly charred. In a large pot or dutch oven, heat 1 tbsp olive oil and saute onions and garlic until soft. Add crushed red pepper, rosemary sprig, bay leaf, 6 cups of vegetable stock and season with salt and pepper to taste. Bring to a boil and reduce to a simmer. Add drained cooked cannellini beans and simmer for about 30 minutes for flavors to combine and soup to thicken slightly. While soup is cooking, blanch green beans for about 2-3 minutes in salted boiling water and rinse under cold water. Drain and set aside. Just before serving add in chard, green beans and cauliflower and heat through. Add more veg stock if needed and check seasonings. 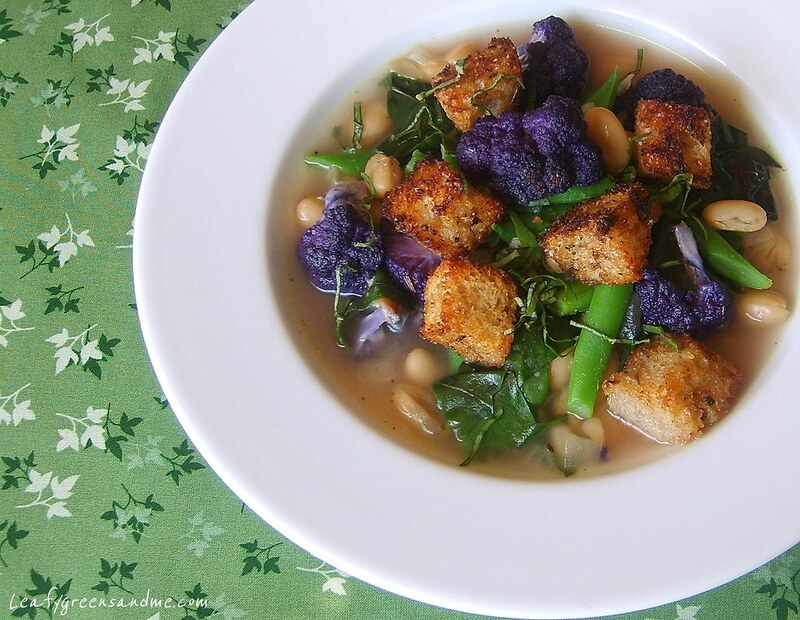 Ladle into soup bowls and garnish with croutons, fresh basil and a drizzle of olive oil if desired. 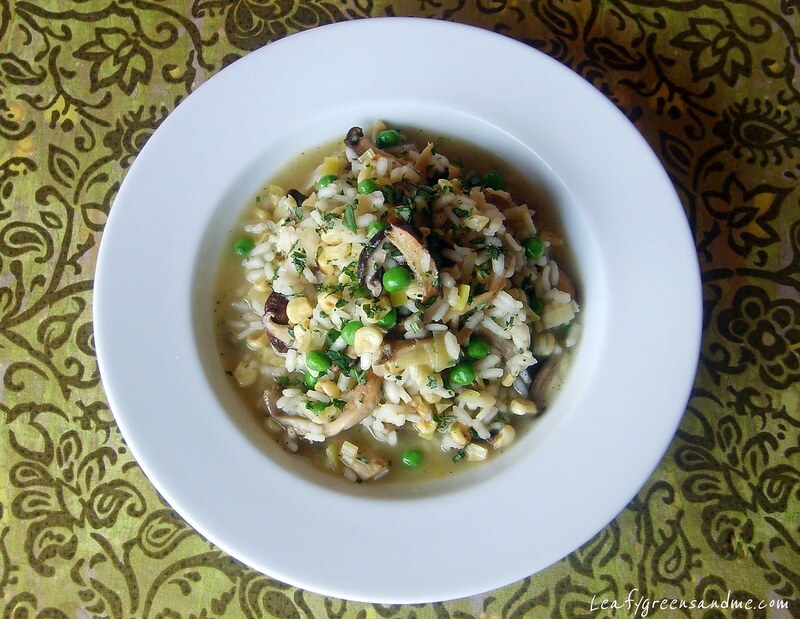 I had a craving for risotto the other day and so I decided to make a wild mushroom and corn risotto. My favorite mushrooms to use in this dish are chanterelle, oyster and shiitake mushrooms, but I couldn't find any chanterelle's at the market yet. Chanterelle's come into season late summer, early fall and are a perfect pairing with corn and risotto. They are golden in color, have a great texture and provide a nutty flavor to the risotto. However, they are really expensive, usually about $25 per pound! If you can find them at your market, purchase a small amount--a little goes a long way. But if you can't find them, no worries, this risotto will still be really delicious without them. Heat vegetable stock, keep warm and set aside. Slice mushrooms and toss with 1 tbsp of olive oil, thyme, salt and pepper. Place on a sheet tray and roast for about 5-7 minutes until golden brown. Be careful not to burn. Remove from oven and set aside. Remove kernels from corn and toss in 1 tbsp olive oil, salt and pepper and roast in the oven for about 10-15 minutes until lightly golden. Remove from oven and set aside. Heat a large saute pan on medium heat and add 2 tbsp olive oil, along with arborio rice. Stir to coat the rice with olive oil. Add sliced leeks, minced garlic, salt and pepper to taste, and cook until leeks are softened, about 3-5 minutes. Deglaze with white wine and cook until almost all wine is absorbed. Reduce heat to medium-low and add a couple ladles of vegetable stock, stirring continuously until almost all liquid is absorbed before adding the next two ladles. Repeat this until rice is al dente and creamy in texture. The rice takes about 30-40 minutes to cook. I prefer my risotto to be loose in texture, not stiff and dry. Just before serving, stir in 1 tbsp minced tarragon, roasted corn, mushrooms and peas and heat through. Add a little more vegetable stock to keep it loose. Season with salt and pepper to taste. Garnish with additional tarragon and a squeeze of fresh lemon juice if desired.